Today at our NYC Music Services site, we’ve released seven new free chord symbol fonts for Sibelius. Four of the fonts are part of the Norfolk family of fonts, which we first made available in 2014, and has since been downloaded thousands of times. Notable for its bold and substantial look, the Norfolk family of fonts is a derivative of Bravura, initially created by Steinberg, that is expressly reconfigured to work within Sibelius. Norfolk has gained wide acceptance among Sibelius users and has made its way into numerous publications, but today is the first time that chord symbol fonts have been available as part of the suite. The other three fonts released today are the inaugural members of a new font family called Pori. Pori is a derivative of Petaluma, the handwritten font that first appeared in Dorico 2.0. Today’s release of Pori only includes chord symbol fonts, but we eventually plan to release an entire Pori suite of fonts for Sibelius, same as with Norfolk. The four Norfolk chord symbol fonts and two of the three Pori fonts can be used as straight-up replacements for any of the chord symbol fonts that ship with Sibelius. The third Pori font is something very special — read on to learn all about it. Bravura, of course, is the first font that was created by Daniel Spreadbury at Steinberg to be compatible with Standard Music Font Layout (SMuFL), the open standard they devised to be used in Dorico. Indeed, Bravura and SMuFL preceded the actual release of Dorico by more than three years. Daniel and Steinberg colleague Anthony Hughes created Petaluma to complement the new jazz features introduced in Dorico 2 earlier this year. Sibelius does not use the SMuFL standard, instead relying on a suite of fonts to generate music notation. This is how, and why, the Norfolk project began — in order to use Bravura in Sibelius, new fonts needed to be created to fit into the existing Sibelius font mapping scheme. After having a conversation with Matthew Maslanka at a local restaurant in the summer of 2014, he set about creating Norfolk and did all the heavy lifting porting Bravura to it and creating the Norfolk house style. Since then, Norfolk has been contributed to, and then expanded to the Pori project, by a handful of Sibelius user all-stars, including Robin Walker, Bob Zawalich, and two essential players in the latest developments: Jeff Kellem and Bernie Cossentino… but more about that in a bit. This is because, when “intelligent” chord symbols were introduced in Sibelius 6, the feature was designed in a very tightly integrated way that relied on all the constituent elements of a chord symbol to be self-contained in the same font. While greatly improving over the pre-Sibelius 5 “legacy” chord symbols, this effectively locked out any customization, as designing a third-party font to be used in Sibelius’s unique way was a very time-consuming endeavor. We encountered this several years ago when creating Norfolk. While not exactly easy, creating the other parts of the suite — the music font, the music text font, and the other fonts making up the symbols, ornaments, metronome marks — was a cakewalk compared to the task of creating new chord symbol fonts. It always felt like a compromise, though, to use the Norfolk fonts with one of the standard Opus or other Sibelius chord symbol fonts. And I knew that if we were going to create a Sibelius derivative of Petaluma, a chord symbol font that matched it was an absolutely necessity. Eventually, the stars aligned (I’ll describe how in bit). After more than 150 revisions, there are four new Norfolk chord symbol fonts to add to the rest of the Norfolk suite. Generally speaking, you can think of each of these fonts as a replacement for the Opus font of the same name. The basic chord symbol font using Norfolk music characters. The text portion of the font is derived from Academico, the text font inspired by Century Schoolbook. It is not necessary to have Academico installed, although we have bundled it in the most recent update to the Norfolk fonts if you want to use it as a text font elsewhere in your document. Similar to Norfolk Chords but using non-superscript accidentals and numbers. This chord symbol font uses sans-serif text. The text portion of the font is derived from Gothic A1, a font by HanYang I&C Co. As with Academico, It is not necessary to have Gothic A1 installed, although we have bundled it in the most recent update to the Norfolk fonts if you want to use it as a text font elsewhere in your document. Similar to Norfolk Chords but using non-superscript accidentals and numbers. Although Sibelius does not include a PlainChords Sans font, we decided to make one anyway! Thus there is no Opus analog for Norfolk PlainChords Sans. The basic chord symbol font using Petaluma music characters. As with Norfolk/Opus, you can think of this font as a replacement for the Inkpen or Reprise handwritten chord symbol fonts. The text portion of the font is derived from Petaluma Script, the text font inspired by the hand copyists for Sher Publishing’s Real Book series. It is not necessary to have Petaluma Script installed, although we have bundled it with the Pori fonts if you want to use it as a text font elsewhere in your document. Yes, it is already plenty exciting that with the six aforementioned fonts, we’ve doubled the number of chord symbol fonts available with Sibelius. But why stop there? Sibelius has never supported this. But that didn’t stop Bernie Cossentino from trying to find a way to make it happen. After many months of experimentation, trials, false starts and countless hours of work, the Pori Angled Slash Chords (ASC) font is a reality. What makes Pori Chords ASC a viable option — and the beauty of its implementation — is that the user can use chord symbols normally within Sibelius, and can freely switch between the ASC font and any other chord symbol font as one currently does, say, to switch from Opus Chords to Opus Plain Chords. Everything happens in the font, nothing needs to be adjusted in Sibelius’s settings or the document settings, and no change in workflow is necessary. In all other respects it is identical to the Pori Chords font. Most importantly, the Pori Chords ASC Std font will only work in Sibelius 2018.11 and higher. This is because the font uses some text generation features that are only supported in Qt 5. You may need to manually adjust the vertical position of some chords when using Pori Chords ASC. As of this writing, the Pori Chords ASC Std font displays correctly on screen as well as when exporting to PDF via File > Export > PDF. However, printing the Sibelius file will cause chord symbols using the Pori Chords ASC Std font to display incorrectly. Until this is resolved, the workaround is to first export a PDF document from Sibelius and then print from the PDF. The Pori Chords ASC Std font does not currently support use with chord diagrams. If you use this font, Chord text only must be selected in Appearance > Engraving Rules > Chord Symbols > Appearance > Show by default. These limitations only apply to the Pori Chords ASC font and not the other fonts described in this post. 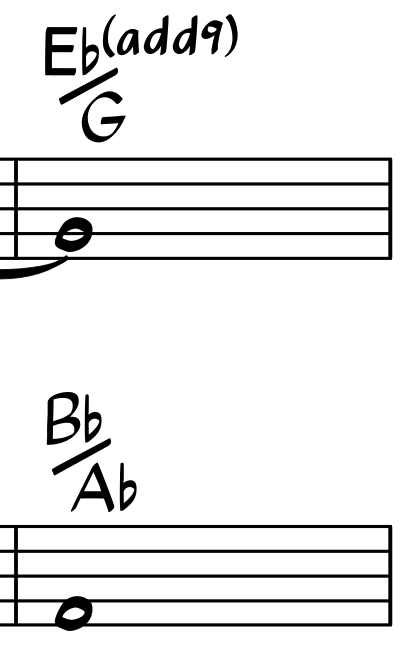 Even with these limitations (at least for now), the ability to finally display an altered bass note underneath an angled separator in a diagonal arrangement in a Sibelius document, and to do so as easily as a simple font swap, is an amazing achievement. If you’ve read this far, you probably want to get right on with downloading and using the fonts. You can skip this next section if you like, but you’d miss out on learning about the hundreds of man-hours that went into this project. Plus, don’t you want to know where the name Pori came from? Shortly after Dorico 2 was released, I considered creating a Petaluma derivative for use in Sibelius, as a complement to Norfolk. Having met Jeff Kellem at the 2017 NAMM show and seeing him again at the 2018 show, I enjoyed learning about his passion for type design. I approached him about taking on the project and, to my delight, he agreed. We prioritized the chord symbol fonts, knowing full well that they would be the most challenging aspect. In addition, I wanted to complete the Norfolk suite by adding chord symbol fonts to that family, as well. I hope you don’t mind my forwarding this email to you with regards to angled slash chords. I’ve been working on a modified font for a while now and have finally got it to behave in a way that makes sense… and to ask whether, at some point, NYC Music Services might be interested in distributing the font for other Sibelius users to download. No, I didn’t mind at all! It was a natural next step to merge our projects, and thus began many months of these fellows working countless hours to produce these fonts. I asked Jeff and Bernie to explain a bit more about their process. Philip and I agreed to treat this project as a font engineering project. In other words, the primary goal of not designing new glyphs. In most cases, any new glyph designs that didn’t exist in the source fonts were created programmatically. One of the big challenges was the lack of documentation of the mapping of semantic symbol to glyph slot, e.g., the G clef sitting in the ampersand slot of the music font. So, a lot of time needed to be spent researching to determine the appropriate mapping for each of the various Sibelius font types. When a symbol was unique, it was easier to map. But, when a symbol design matched others, then we’d attempt to verify that our guess was an accurate one. In some cases, we were able to match the mapping with the name and slot references in the Symbol table. A manual and tedious process. Then, through comparisons and assumptions about use cases, a decision between using the Music or Music Text SMuFL-compliant font was made. Glyph registration is not always the same between the SMuFL specification and the Sibelius fonts. Registration refers to the size and positioning of the drawing for each symbol (glyph). So, adjustments would be made. Sometimes, during testing, we would notice that our initial guess would be incorrect. For example, what looked like a design that would sit on the baseline, Sibelius might expect it centered at another Y (vertical) position. This would usually be noticed (and necessary) when the designs did not match in size. The side bearings (the space on each side, left and right, of the drawing) had different requirements between the source fonts and Sibelius. For the SMuFL fonts, the side bearings for some symbols might be zero, but space was necessary in how Sibelius used the glyphs. Designing for three styles — Pori, Norfolk, and Norfolk Sans — meant trying to come up with adjustments that would work for most of them, providing an override when necessary. The designs and variability were completely different among the fonts and within a font, at times. Some glyph designs were missing, e.g., superscript numerals. Petaluma Script happened to have a stylistic set with superscript numerals. Academico, on the other hand, did not have superscript numbers. So, the Academico superscript numbers were scaled and positioned, programmatically. As a type designer, I prefer to create designs specific to the use. Superscripts and small capitals are not simply scaled to a smaller size, though some software erroneously does do that, including music notation applications. Simply scaling down creates forms that seem too light when compared to surrounding full-size glyphs. Since designing new glyphs was out of scope for this project, we worked on doing this programmatically, but attempting adjustments to create the feel of a similar weight. The stacked alterations in the chords fonts needed to be created. The component glyphs that made up a stack were not designed for those sizes. This was one of the spots in which the creation of the glyph was done programmatically, from sizing to placement in the stack. The variables for that were specific to each set of source fonts. During quality assurance testing, we decided to improve the look of the chords by adding kerning pairs to remove some of the space. For example, this is noticeable in an A7 chord with a superscript 7; the 7 feels like it’s separate from the A, like another word. With three chord font styles being created, all with differing characteristics in their designs, there were lots of comparisons of adjustments, trying to come up with values that worked across all three. Sometimes overrides were necessary. For example, the full-size 7 in Pori Chords has an extremely angled diagonal. So, it would need to close up the space much more when followed by a slash than in Norfolk Chords. Some of the quality assurance testing that turned up issues included comparing against previous versions of the test fonts, comparing against existing Sibelius fonts for shape and positioning, and testing within Sibelius on macOS, Windows, and across various Sibelius versions. Through this iterative process, changes to adjustment parameters and mapping were made. Simply comparing to the previous version of the test Chords/PlainChords fonts means looking at 1,264 glyphs, with each new version. That number doesn’t include Bernie’s ASC fonts. With the wide variety of ways to represent a chord, configurable by the user, there are a lot of variations to review. It’s possible we missed some combination or specific chords, though we attempted to cover common variants. Let Philip know if something should be fixed. Angled slash chords: Easy for any copyist to write the old fashioned way…by hand, but quite a chore to accomplish in most scoring applications, including Sibelius. A quick web search will list plenty of Sibelius workarounds and tedious solutions suggested over the past few years. This last June, I read of one such solution, stemming from resizing isolated characters of the chord in text input, adding the slash, rotating it, adjusting line spacing, adding the bass letter on a return line, and so on. All this…just for one chord? This kind of remedy was enough to deter most anyone; succumbing to simply let the chord lie horizontal. 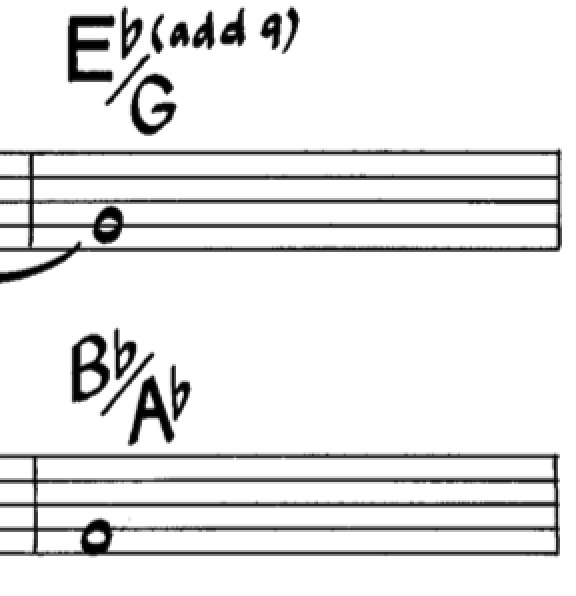 It had me thinking: Why must it be so difficult to create these chord types in Sibelius? I’ve edited several music and text fonts for use in my own scores and questioned whether a font can be modified in a way to create chords in an angled fashion. Shortly after reading the above workaround, I decided to open my font editor and experimented a little. Sure enough, I was able to adventurously kern a few character pairs; a letter to a lowered slash, and then a slash to a lowered letter. That was easy, and there was plenty to get excited about already. Ah, but there were problems! While kerning glyphs one to one was simple, kerning strings of them was another matter, altogether. Add to this, Sibelius wasn’t happy with the kerning routines I applied. i.e. Though the kerning rules worked fine as a web font, I quickly realized that Sibelius was not fully Open Type aware. Thus began the challenge of finding the right kerning (GPOS) features that Sibelius would understand. After a few tries, I finally had a simple chord symbol, along with accidentals, kern and natively displayed in Sibelius successfully. At this stage, I knew we were off to the races. I contacted Bob Zawalich, Robin Walker, Sam Butler and Joe Pearson at Avid, and showed them what I had going. After a few exchanges, it was suggested I loop in Philip Rothman, who then looped in Jeff Kellem. It appeared Philip and Jeff already had font projects of their own going. We decided it was a good idea to pool our resources together and produce the fonts provided today. I was encouraged with the new team and blessed with their assistance, not to mention some directional “feature” advice from Jeff. Thus, progress was being made and I managed to get the font working to the point where all chord types were displaying angled slash results by default i.e. positioning the slash at the end of the chord string, followed by the repositioned bass root. This was already fabulous, and we could have called it a day. But that would have only satisfied a small portion of the user base who may be entering very basic chords like Bb/D or even C7(b9)/E. This would not suffice. Users who rely on more complex chords like Bbmaj7(b5)/D might not be satisfied with a default angled slash result. Indeed, having the slash in this position (below the right parentheses) added to the score’s already precious vertical real estate. Thus, I wanted to find a solution to reposition the slash inside the left parentheses so that it adorned the main part of the chord, before the altered extension. This solution helped save some of that critical vertical space (especially for double and triple stacked alterations) with the added benefit of further homogenizing the chord symbol itself. Though quite laborious, it was a logical decision to continue along these lines. The bulk of the font work lies here and required many revisions to complete, accommodating the most common and complex chords. So after numerous restarts, roadblocks, and even a surprise detour towards the end of our adventure, angled slash chords in Sibelius have finally become a reality. We hope the results speak for themselves and trust that these fonts, and certainly this Pori Chords ASC variant, find plenty of use in your scores! Pori, incidentally, derives its name from the coastal city in Finland which is home of Pori Jazz, a large international jazz festival held annually in July. Thanks to my good friend Alex Freeman for suggesting the name! Go to the Resources page at NYC Music Services to obtain the fonts. You’ll need to register with a valid e-mail address, and then you’ll receive a link to download the fonts. If you’ve already registered and downloaded the Norfolk fonts, you’ll have received a separate e-mail with a download link — no need to re-register for those. The Pori fonts are a separate download package, though, so even if you’ve registered Norfolk you’ll need to register to obtain the Pori fonts. Registering to download the fonts means you’ll get notified directly about any future updates, including when the full Pori suite becomes available. The fonts are free to use, at your own risk. As such, I won’t be able to offer any support for them, although if you notice a problem, please let me know. Essentially, you just need to install the fonts on your computer in the usual manner, and restart Sibelius if it was running. More detailed information is found in the documentation that comes bundled with the font package, so be sure to read it, especially if you’re a new user to the Norfolk fonts. You can switch to any of the chord symbol fonts by simply heading to Text > Styles > Edit Text Styles, select Chord Symbol, and click Edit…. In Basic Formats > Font, choose one of the chord symbol fonts. See the Sibelius reference manual, 5.8 Chord Symbols, to learn more about how to use chord symbols in Sibelius. We owe a huge debt to Daniel Spreadbury, Anthony Hughes, and Steinberg for creating these fonts. Naturally, this project wouldn’t exist otherwise. In case you were wondering: All of their fonts were released under the SIL Open Font License, which allows us to freely modify and distribute them as we are here. (The Sibelius default fonts, incidentally, are protected under copyright, and it is not permitted to use them in the same way.) I’m very grateful for their decision to make the fonts available under the Open Font License, and, per the license, the Norfolk and Pori fonts are also distributed under the same license. To Jeff and Bernie — I am inspired by your dedication, attention to detail, and artistry in putting this together. Thank you! Thanks to Bob and Robin for all the feedback and support. And thanks to the Sibelius team, including Sam Butler and Joe Pearson, for their support — in addition to the support for Norfolk in recent versions of Sibelius (making setup easy in Preferences > Music Fonts) and in Sibelius Cloud Publishing, once we release the full Pori suite, you’ll see future Sibelius releases support the Pori fonts in the same way. Chord symbols might just be one of the most difficult components of music notation software. The seemingly endless variations and display options — you’ll want to read Darcy James Argue’s take for one informed point of view — must make for enormous programming challenges. Dorico 1.0 omitted chord symbols completely, and when the Dorico 1.1 release included them, its unique and comprehensive approach was widely touted. Finale has long had customizable chord symbols and a powerful editor, but at the expense of user-friendliness. The recent improvements to chord symbols in v26 focused on adding more precomposed suffixes to the libraries, not way chord symbols are defined and edited. Sibelius’s chord symbols are relatively easy to use, but it comes at the expense of font choice and display options. That’s why releasing a handful of new fonts that look great and work well in the program is a big accomplishment — all the more so coming completely from dedicated users working hard, largely in their spare time and at sometimes crazy hours. Enjoy these fonts, and stay tuned. There’s more to come! Fantastic, thanks so much Philip and others!!! Psst. Philip did a ton of work too! These look great, can’t wait to try them out. Many thanks! 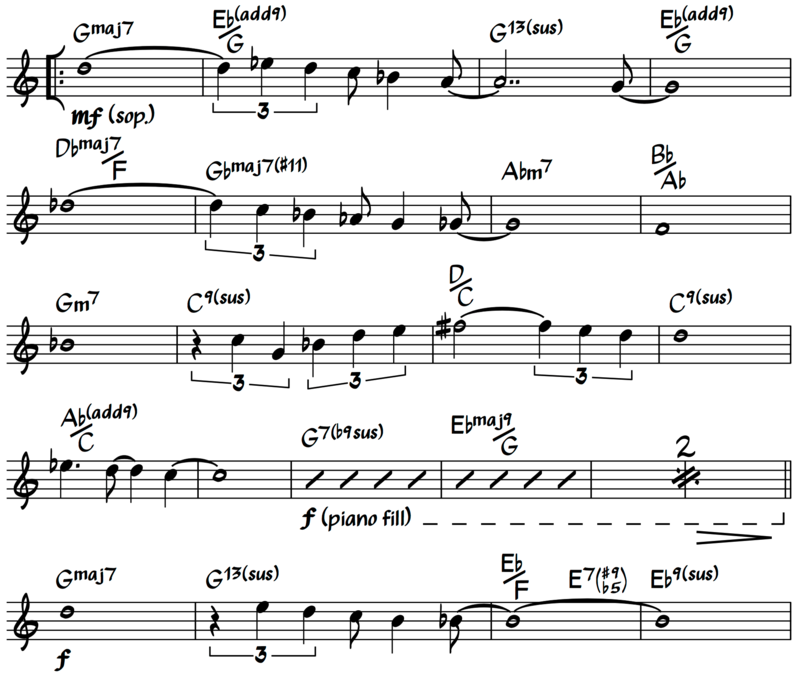 This has been one of the most annoying things about doing jazz & rock charts in notation software for years. I’ve spent hours & hours faffing to try and achieve this, and gave up in frustration. This font looks pretty much exactly like the beloved ‘New Real Book’ chord format, which I tried to emulate, unsuccessfully, for a long time. I love the Pori Chord Fonts! Excellent Initiative! Thanks, Andre! More to come! Scoring Notes curated list of recommended products at Amazon — books, computer accessories, and more!